In order to thrive, turf lawns need to be porous enough to allow oxygen, water, and nutrients to penetrate down to the root zone. Lawns that are too compacted or which have too dense a thatch layer can prevent air, water, and nutrients from getting down to the roots. This depends on the type of grass and the type of soil you have for your lawn. The best times to aerate are in the fall, at least 4 weeks before the first hard frost, or in the spring. The best time to aerate is mid-spring to early summer before it gets too hot and dry. Lawn aeration may be undertaken in the spring for warm-season grasses, as soon as the soil has thawed. Aerate your lawn as frequently as needed. Most healthy lawns don't require aerating more than once every two or three years, but high-traffic areas can benefit from yearly aeration.Soil cores contain beneficial organisms that help reduce thatch in a lawn. If the soil underneath your grass is damp, but not overly wet, you'll find it easier to push either a long-handled aerator or a single-plug aerator into the soil. Wait until the soil is damp after a few rainy days, with one or two days for the lawn to dry out slighly. Or, water the lawn for two or three days before aerating, until the water penetrates down at least 1 inch. Come with a 100% Satisfaction Guarantee and your satisfaction is what is most important to us. If our lawn aerator tool do not helps your grass growth well, please contact us to help us do better in the furture. 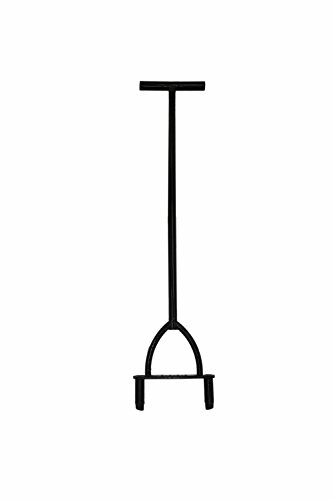 DianMan Long-handled Aerator with foot bar for extra leverage. Perfect garden tool for easily aerating small yards, breaking up compacted soil, helping grass grow vigorously and reducing thatch, moss and other lawn problems. 【Features a Big Step】 for more power and a strong steel shaft and welded steel construction(Stick Welding). The metal cores are sharp and the end and the step in after a couple inches to help prevent clogging(Different from the spike shoes, which can be dangerous for people when the spikes come off ). 【Cost-effective Solution】If you have a small yard, or a very spectific area where a large aerator would be overkill, and you also have plenty of time of your hands, then you can complete the task with DianMan Manual Lawn Aerators Tool. 【Aeration Basics】DIY aerator needs to reach from 2 to 4 inches deep into the lawn, with the diameter of each plug about 1/2 to 3/4 inches wide. DiamMan Coring Aerator removes TWO 3/5inches WIDE 3inches GRASS LAWN CORES, effectively promotes vigorous root growth. 【DianMan 】Come with a 100% Satisfaction Guarantee and your satisfaction is what is most important to us. If our lawn aerator tool do not helps your grass growth well, please contact us to help us do better in the furture. If you have any questions about this product by DianMan, contact us by completing and submitting the form below. If you are looking for a specif part number, please include it with your message.